It seems everyone is on social media these days, but actually, that is not true. While user levels are increasing on Facebook, Twitter, Google+, Pinterest and YouTube, a lot of small businesses continue to hold back. How do I know this? Business owners regularly ask me why they should consider social media marketing and how to get started. Clearly, they ask because they are not yet in the social media picture. Just last week, at a social media workshop sponsored by my local chamber of commerce, most attendees were still wondering what they need to do, where and when. Some expressed confusion, others are afraid of wasting large amounts of time, and most just don’t have a clue where to begin. Don’t be afraid — it’s easy to wade into the pool. Come on in, the water’s fine. Once you get your feet wet, you’ll begin to understand how this crazy hodgepodge of social media sites can actually move your business forward. Social media marketing is just one tool in your versatile marketing toolkit. Your integrated marketing mix should harmonize online and traditional offline components to drive customers and prospects to your website, convincing them to either buy directly or contact you via email or telephone. 1. You have a well-crafted website in place as the hub of your online presence. 2. You create content on that website – articles, reports, blog posts, things of value to readers – that establishes you as an authority in your field. 3. Google indexes your content and online searches drive people to your site. 4. You capture their names and email addresses and build a list. 5. Once you determine where your target audience spends time in social media, you set up profile pages and get started. Usually concentrate on two social media outlets, otherwise it’s too much. But eventually, you will want to maintain profiles on all the main social media platforms, and these profiles should be branded consistently with the same look and feel. Denise Wakeman, online marketing advisor and founder of The Blog Squad, recommends setting up a Word document containing your business profile, your contact information, and links to all your social media sites. Then, when you need to set up a new profile somewhere, you don’t need to search for the right words or links. In addition, for indexing purposes, Google likes it when your profile is consistent from site to site. 6. LinkedIn is a no-brainer – you should have a profile page there for professional purposes. A complete profile with recommendations establishes your credibility and authority in your industry. Join logical groups and reach out to share your expertise. 7. On Facebook, you want to establish a business page where people “Like” you and you can share your own information and other people’s information, publicize events and workshops, comment on things interesting to you and be the expert in your area. This page is separate from a personal profile – the “Likes” are not the same as “Friends” in a personal account, although you can always share posts from your business page on your personal page. Information you post links back to your website, where you capture people’s names and email addresses as they visit. 8. On Twitter, you post links to your articles, mentioning events and seminars, share articles by others and ideas related to your business and your prospects’ interests. Again, links go back to your own website to draw traffic to your hub. 9. On Google+, you create circles of interest and again share your articles, your company information and interesting content posted by others. In my experience, the dynamics here promote conversations at a higher level of discourse. A huge benefit is that Google indexes your posts immediately; often articles you share jump to page one of your keyword search, which is fabulous for driving visitors to your website. 10. Pinterest, the image-driven social media site which exploded onto the scene this year, and YouTube, owned by Google, are two more highly useful platforms for posting content and attracting visitors to your site. 11. As a rule of thumb, share at least 20 non-soliciting posts of tremendous value for every one that presents a sales offer. 12. The point of bringing everyone back to your website for name/email capture is that your email list is the most important marketing tool you have – these are people who opt-in and want to hear from you, and whom you can contact whenever it’s important to do so. Through social networks, you educate and showcase your expertise in a likeable manner that invites people to work with and trust you. Social media is for building relationships, offering valuable free content, showing how you can help others by contributing to the greater good, and demonstrating your passion for your business and industry. A few tips: Post when you have something to say or share. Don’t force it. Tailor your posts for the different platforms – folksy for Facebook, short 140 characters for Twitter, thoughtful for Google+, pictorial for Pinterest. Sprinkle your posts around, posting an item on one network one day, and somewhere else the next day. Be sure to track your website analytics to see which social media sites are working best for you. 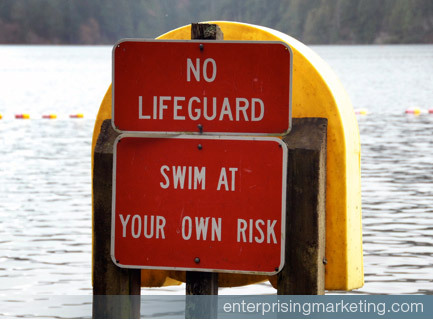 When you first take the plunge, you may have no idea where social media marketing will lead. It’s difficult to start with a focused plan or set marketing goals when you’re not certain how things will play out. But following the main guidelines will set you in the right direction. With a little practice, things will start to make sense and you’ll find your own voice. If this post was valuable for you, please let me know in the comments! And I encourage you to subscribe to my email list so you receive related updates and notices when new articles are published, usually never more than once a week. To receive free updates, click here.